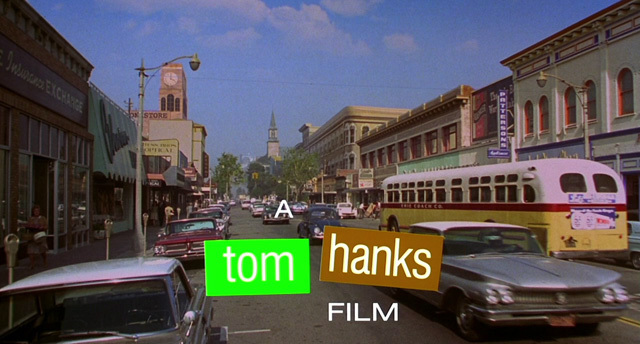 I’ve been writing about working as an extra on That Thing You Do, Tom Hank’s directorial debut. You can read it from start to finish on the Brushes with Stardom page. The set was the interior of an appliance store plucked right out of the 1960’s. As usual on a movie set there was a dull whirr of background noise, crew hammering, people yammering. There were a lot of people milling around, associate producers and set assistants who didn’t need to be there. Hair and makeup artists, the prop master, the gaffer, the script supervisor, who did. Oh yeah. And the director, the director of photographer, and the lead actor. I was so nervous, they were all a blur to me. I tried not to stare at Tom Hanks conferring quietly with his DP, Tak Fujimoto. I knew Fujimoto was a fairly big deal, he’d worked with Tom on Philadelphia, shot Jodie Foster in Silence of the Lambs, Molly Ringwald in Pretty in Pink and Matthew Broderick in Ferris Bueller’s Day Off. And now, he’d be shooting me and Russell, for our one second of fame, in That Thing You Do. It wasn’t just movie lingo for coming to set asap, the first A.D. had whisked Russell into his own arms and air-planed him over to where Tom Everett Scott, tall, darkly clad, was waiting, a friendly looking grin on his face. I’d followed sheepishly in their airstream, trying not to beam as my son lit up the room. The A.D. deposited my almost three year old back into my arms. “Rehearsal up!” The AD’s voice boomed throughout the shop, suddenly all the whirring and background hammering stopped. Tom Hanks was back behind camera. Tom Everett Scott picked up the mixer from the bowl while I looked interested and tried to make sure my son was engaged. I didn’t think Russell cared about the mixer but all those lights were mesmerizing. Then, in a firm but not overly loud voice, Tom Hanks called out the magic word. Action. The A.D. repeated it, a loud booming echo. Outside on the street, I knew my husband would be calling out action too, making sure the crew and cars were all still. Once more Tom picked up the mixer. Once more he held it out for me to marvel at. Once more Russell shifted. This time clear around facing the storefront window. “I think I see my friend” he pointed. I looked in time to see his dad—his friend—disappear quickly from behind the window. They did get it. Our one second of fame can be seen during the opening credits of That Thing You Do. 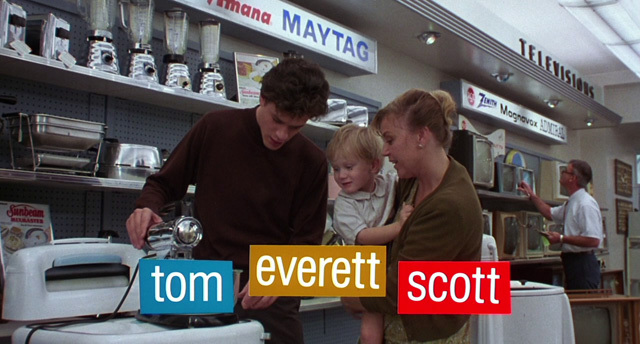 There’s Tom Everett Scott picking up that mixer and there’s Russell looking skyward and then back down. Me? I’m just the background actor, the proud mom in the scene. Between you and me? I nailed it. Later on in the shoot, my mother and my sister-in-law Eva came out to work as extras in the fairground scenes, the song Mr. Downtown, played so often that day, it embedded itself in all our heads. More than a memory, I can pop our copy of That Thing You Do in the blu-ray player anytime and there, standing out from the crowd—to my eyes anyway—my mother, before Alzheimer's reared its ugly head, walking with my sister in law Eva, their hair and clothes straight out of the early 1960's, dressed as fairgoers. I'm in the scene too, my back to the camera in case anyone recognizes it from the earlier scene set in a completely different part of the country. Andy Warhol famously said we'll all get our 15 minutes of fame. That Thing You Do was ours. Read all five entries in my behind the scenes look at working as an extra on That Thing You Do in order. 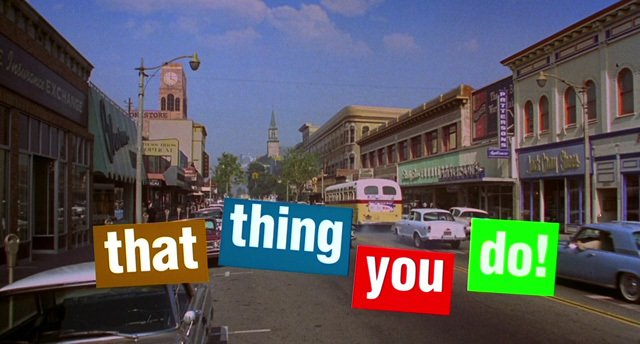 That Thing You Do was such a wonderful film. You captured this episode of your involvement in the film very well. So interesting to be captured in film history by being an extra.